A very low mat-forming selection, especially useful in hot sunny sites. 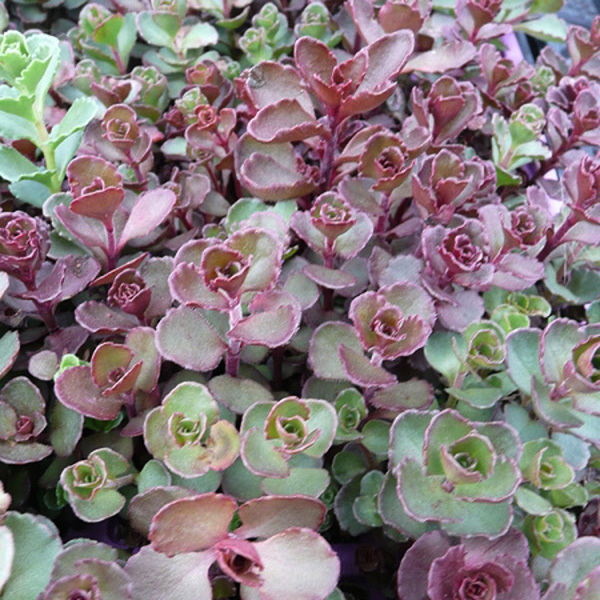 This Stonecrop has rounded bronze-green to beet-red leaves and small clusters of ruby star-shaped flowers in summer. Useful for massing as a lawn substitute over small to medium-sized areas, also for planting between flagstones or in the rock garden. Plants will tolerate poor soil so long as drainage is good. Blaze Stonecrop is easily propagated by breaking off pieces and sticking them in the ground in mid spring. Tolerates occasional to light foot traffic. Mow or prune back in spring.